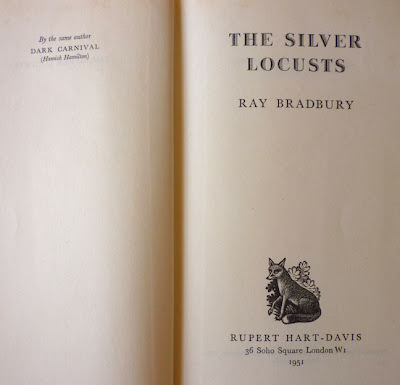 Ray Bradbury's The Silver Locusts was first published in hardback in the UK by Rupert Hart-Davis in 1951, under a magnificent dustjacket designed by Roy Sanford, who, among other jacket designs, also created the similarly splendid cover for the 1954 British edition of The Night of the Hunter I blogged about back in June. 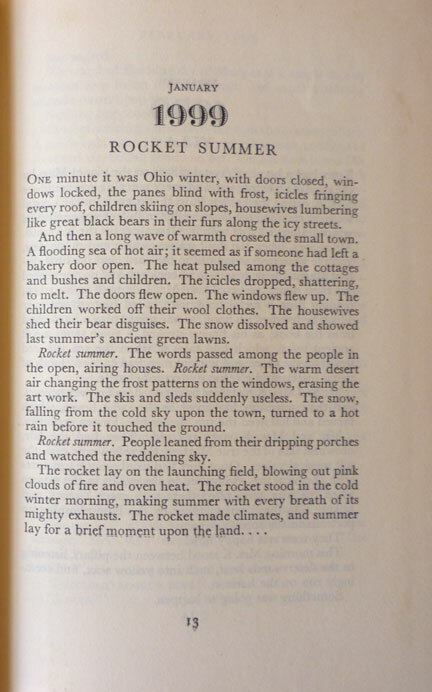 It's a collection of short stories originally published in various American science fiction magazines in the 1940s – with additional linking vignettes – and it is, of course, rather better known by its more prosaic US title: The Martian Chronicles, as first published in the States by Doubleday in 1950. Although personally I prefer the allusive British title, which was inspired by one of the stories in the collection, "The Locusts". 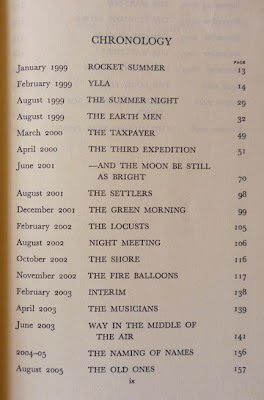 I've mentioned Ray Bradbury's short stories a couple of times before, most recently in this post on a Donald E. Westlake short SF tale; quite simply I'm of the firm belief that Bradbury was one of the most important and original short storytellers of the twentieth century, a supreme craftsman of poetic prose, vivid imagery and memorable payoffs, and The Silver Locusts/The Martian Chronicles is to my mind his crowning achievement. The initial four stories proper in the collection are mini-masterpieces of science fiction horror, each telling of the arrival on Mars of a rocket ship from Earth, the fate that befalls the crew of each ship, and the effect the Earthmen's arrival has on the native Martians; the third story in particular, "The Third Expedition" (originally titled "Mars is Heaven"), still sends a shiver down my spine every time I read it. Thereafter the tales take a turn for the increasingly philosophical, as the colonisation of Mars gathers pace and the Martians head inexorably towards extinction. But the gradual elimination of Mars' original inhabitants is matched by the rumblings of war back on Earth, which are referenced in some of the later stories. These reach their inevitable crescendo in "The Off Season", in which Sam Parkhill, one of the astronauts from the fourth mission to Mars ("—And the Moon Be Still As Bright"), who has since set up a hot dog concession in anticipation of a deluge of visitors from Earth, encounters a group of Martians who grant him a surprising boon. The sting in the tail comes at the end of the story, as Sam and his wife witness from afar the devastation of their homeworld, the ramifications of which subsequently play out both on Mars and, in the mournful "There Will Come Soft Rains", back on Earth, until we reach the moving, circle-closing climax, "The Million-Year Picnic". The Chronicles have been through umpteen editions over the years under both their US title and their British one, and many editions are subtly different. 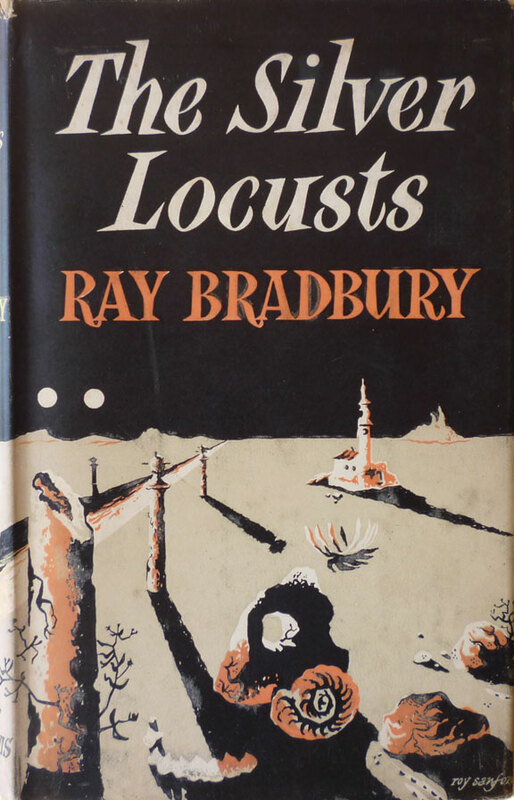 The first edition of The Silver Locusts, for example, drops the story "Usher II" – which appears instead in the 1952 Hart-Davis edition of The Illustrated Man – and includes in its place "The Fire Balloons", which did not appear in the 1950 Doubleday edition of The Martian Chronicles. That actually works in the favour of The Silver Locusts, because Father Peregrine, who features in "The Fire Balloons", later reappears in "The Luggage Store". 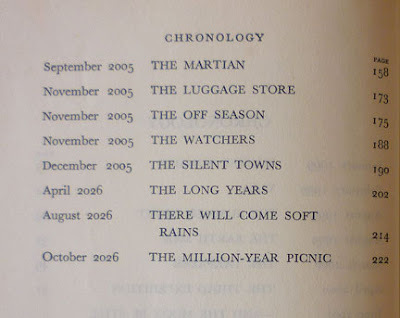 (Handily, the Wikipedia entry for The Martian Chronicles exhaustively details the changes from edition to edition.) As for my particular prized first edition/first printing of The Silver Locusts, that was a fairly recent eBay win, but generally you'd be looking at anything from £70–£200 for a decent jacketed copy. 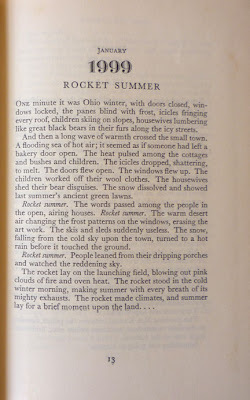 UPDATE 6/6/12: Sadly, Ray Bradbury died last night, and though there will doubtless be more eloquent eulogies in the days and weeks ahead, I hope this post goes some small way towards expressing how much his extraordinary stories mean to me, and, perhaps, helps to introduce a new reader or two to his wonderful writing.